Inspired by the wellness benefits of yoga, a small team of mattress experts launched the Yogabed in 2015. The Yogabed is an all foam mattress that is aimed at reducing pressure points and improved temperature control. Is the Yogabed the right option choice for you? Read on for my full review! Enjoy a cozy balance of body-hugging foam and great support (especially for lighter sleepers!). Take $100 off your purchase by using the code SLEEPOPOLIS! The Yogabed is an all foam mattress standing 10 inches in height. It combines a mix of polyfoam and memory foam to provide a medium firm feel that should be good for a wide range of sleepers. They also take steps aimed at temperature regulation, too defend against sleeping too hot. Cover – The cover is a polyester/cotton blend that I found to be pretty breathable. It is thin enough to allow airflow through the mattress, which should help with cooling, and also means it won’t interfere with the feel of the top foam layer of the mattress. Something to note about the cover is that it fully unzips, so that the white fabric top can be machine washed. Comfort Layer – The top layer of the Yogabed is 1 inch of proprietary foam called Yoga Instant Response Foam. This layer has a density of 5 lbs and is pretty soft to provide comfort to the sleeper. As its name suggests, one of the main things to note about this layer is its quick response to pressure. 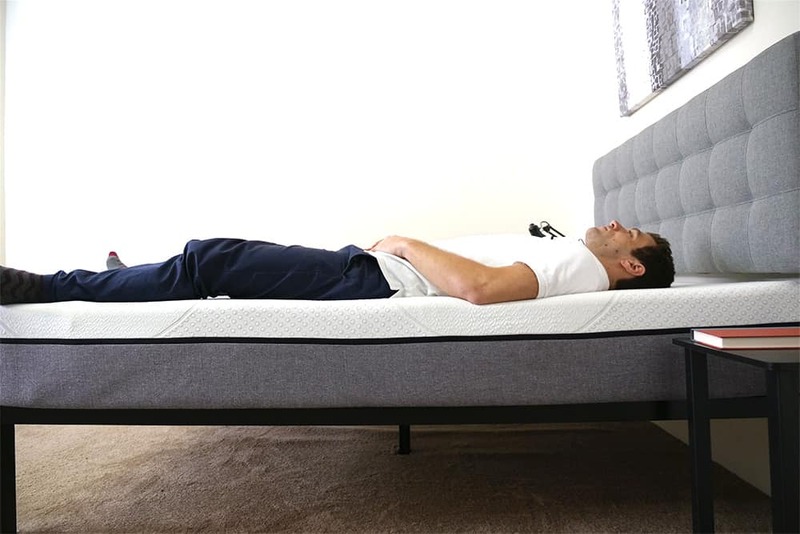 While it does provide some pressure relief, it has more bounce than a memory foam would, which keeps you from having that feeling of sinking into the mattress. Memory Foam – The next layer down is made of 2 inches of gel memory foam with a density of 4 lbs. 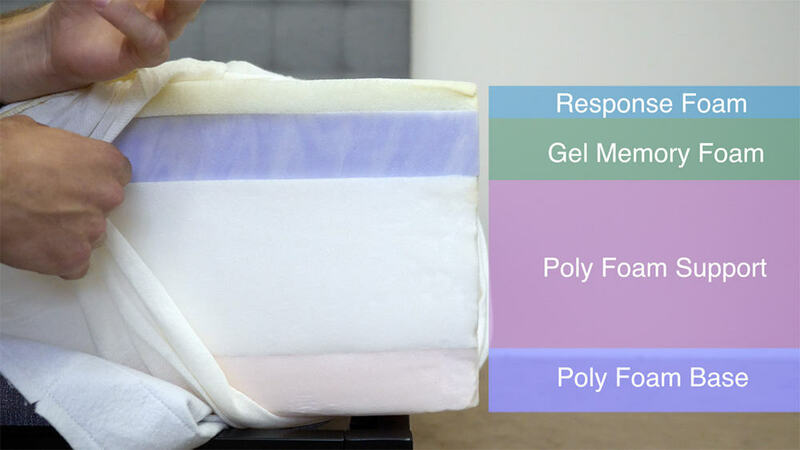 While regular memory foam has a reputation for trapping heat, gel memory foam does a good job of temperature regulation, helping to keep the sleeper from overheating. Memory foam provides body contouring and is also important for pressure relief. The memory foam used in the Yogabed responded slowly to pressure which can cause people to have the feeling of sinking into the mattress. 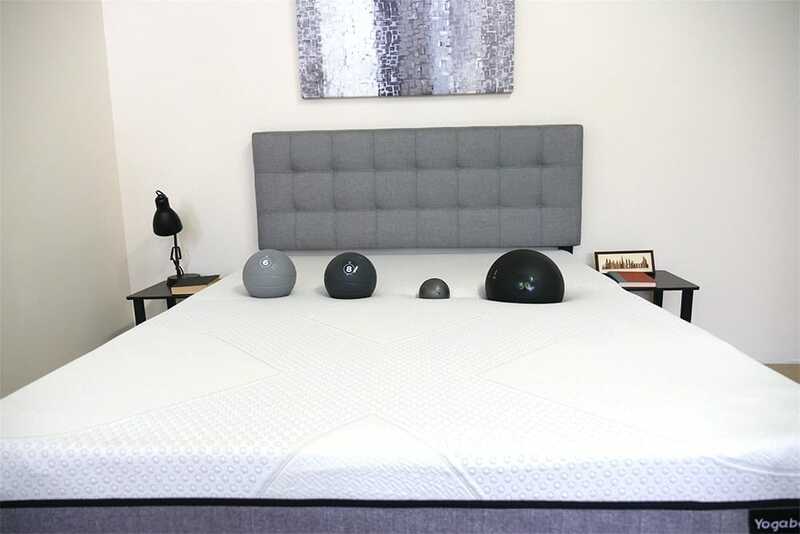 By placing this layer underneath the response foam, Yogabed is aiming to provide the pressure relief of memory foam, without the feeling of being stuck in the mattress. Support Layer – The next layer is a part of the base and provides support for the sleeper as well as the mattress layers above. Made of 5 inches of high density poly foam with a 1.8 lbs density, it is very firm and provides the mattress with its shape. Base Layer – This is another high density poly foam with a 1.8 lbs density. This 2 inch layer acts as the base of the mattress and lends some durability to the structure. Showing the layers of the Yogabed. When first pressing into the top of the mattress, it is reminiscent of a yoga mat, with an initial firmness before it contoured to my hand. When I removed pressure, the top layer of response foam regained its shape quickly, showing that the mattress has some bounce to it so you should be able to change position without interference. Due to variances in size and body type, everyone will feel the firmness of a mattress differently. Rather than just taking my word for it, I brought in three other testers to give their opinion as well. The multiple opinions should give you a better sense of the firmness range you can expect from the Yogabed. 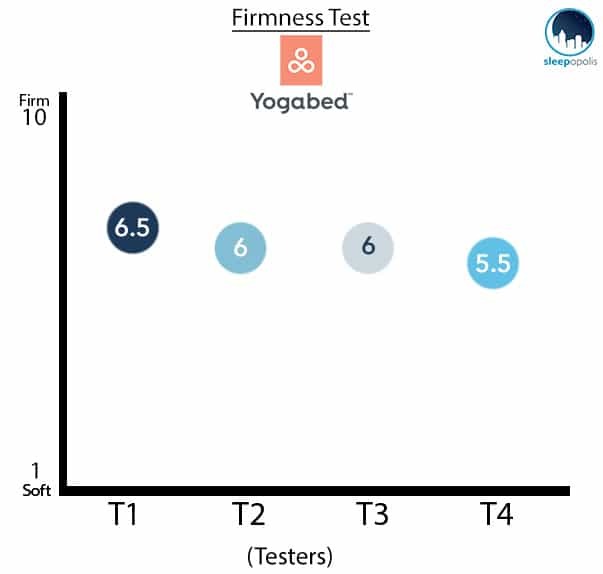 Our four testers felt that the Yogabed fell squarely in the medium firmness category. With the average response placing the firmness at 6/10, the mattress provides a general feel that should be good for a wide range of sleeping preferences. As long as your needs aren’t too specific, the Yogabed should provide a solid combination of support and pressure relief. I rated the Yogabed as a 6.5 on the Sleepopolis firmness scale. I felt that the top layer of response foam caused me to feel more on top of the mattress than as if I was sinking into it. While that feeling led me to rate this a bit firmer than the other testers, I still found the Yogabed provided good pressure relief, placing it in the medium firmness range. Like a firm feel? Check out my firm mattress top picks. Instead of just describing the feel of the mattress to you, I wanted to give a visual representation of where someone may feel pressure points form while lying on a Yogabed. To do this, I placed a pressure map on top of the mattress and lied down on my back, side, and stomach. On the image below pressure will be represented from blue (low pressure) to red (high pressure). Pressure map for the Yogabed mattress showing me laying on my back, side, and stomach. When I first lied down on the mattress on my back, my weight evenly distributed, the results from the pressure map show that there is low pressure across my entire back. I could feel the top layer of foam push up and fill in the space beneath my lower back. While lying in this position I definitely felt that I was on top of the mattress, more so than sinking into it. The low pressure results of the test, along with the feeling of being on top of the mattress go along with the layering of the mattress, with the response foam over the memory foam, keeping you from feeling stuck. Rolling onto my side we can see a slight increase in pressure as there is greater weight concentration over a smaller surface area. It’s important to note that side sleepers often have issues with pressure points forming at their hips and shoulders, so they tend to prefer softer mattresses for greater pressure relief. 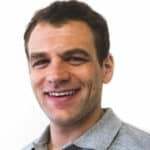 Memory foam has great pressure relieving attributes and in this position I start to push further into the mattress and interact with the gel memory foam layer. I can say that when compared to previous mattresses tested, the Yogabed does well on the side sleeping portion of the pressure map test. Finally on my stomach, my weight is evenly distributed again and the pressure map shows mostly blue for low pressure across my body. That low pressure is good in this position as it allows me to breath easier. Another important point about feeling more on top of the mattress is that the Yogabed kept my hips from sinking into the mattress. This is very important for stomach sleepers as they want to keep their hips up to make sure their spine stays aligned. If you plan on sharing your bed with a partner, you’ll want to know how it will feel when another person gets into and out of bed or tosses and turns during the night. 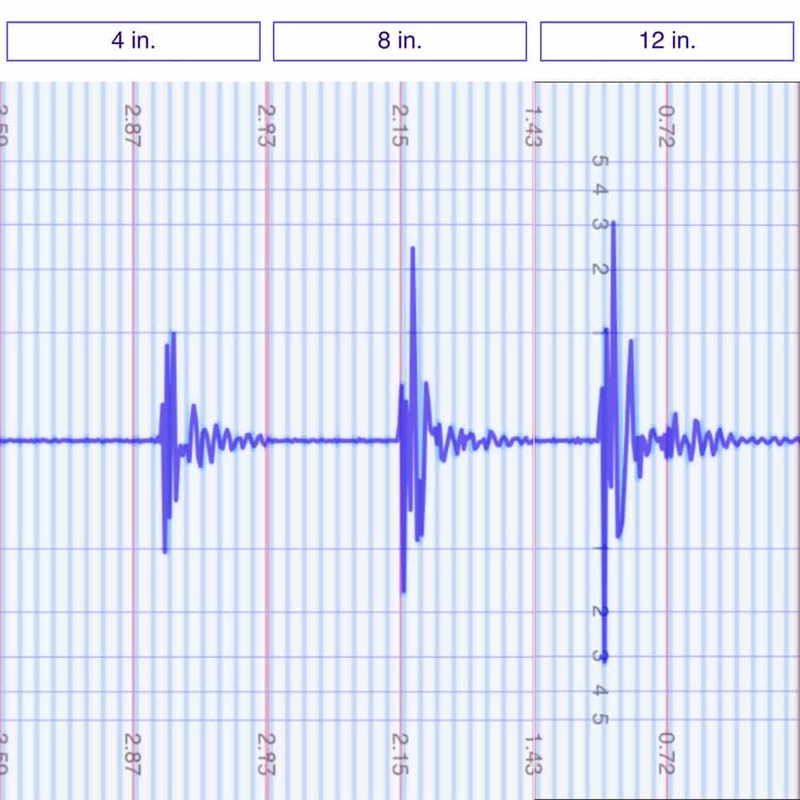 The next test is helpful in showing the intensity of disturbance felt from one side of the mattress when there is motion on the other side. Motion transfer results for ball dropped from 4 inches, 8 inches, and 12 inches. The 4 inch drop is meant to simulate someone tossing and turning on the other side of the bed and shows a small disturbance felt. There is a bit of movement transferred initially, but it dies out quickly after the drop occurs. The 8 and 12 inch drops show higher spikes in disturbance felt, which is to be expected. These drops are meant to simulate someone getting into or out of bed on the other side and as you can see there would be more movement felt when this occurs. Depending on personal sleep preference, many people will want to know whether they are going to feel more on top of or sunken into a mattress. To get a better idea of how people will feel on a Yogabed, I use four balls of varying sizes and densities (a 6 lb medicine ball, an 8 lb medicine ball, a 10 lb steel ball, and a 50 lb medicine ball) and place them on the mattress to measure how much they compress the surface. 6 lb medicine ball: A little more than 1 inch of sinkage. 8 lb medicine ball: 1.5 inches of sinkage. Heavier sleeper? Check out my best mattress picks for 300+ lbs sleepers. If you plan on sharing your bed with a partner and need to use the entire surface area of the mattress, you will want to have a look at the edge support provided. Foam mattresses can sometimes struggle to live up to the edge support of traditional innerspring mattresses, so I was interested to see how the Yogabed was able to hold up when I was near the side. I felt pretty well supported while lying near the side of the bed and was able to change positions without feeling like I was compressing the mattress too much and would roll out of bed. When I rolled onto my side and hung off the mattress a bit, I did start to see some compression, but didn’t feel like I would roll completely out of bed. When I sit up on the side of the mattress, with all of my weight over one area, we see a pretty good amount of compression, which is pretty common among foam mattresses. This position is meant to simulate putting your shoes on in the morning and may not be the most important when it comes to picking out a mattress, but should give you a good idea of the type of compression you can expect when placing pressure on the edge of the Yogabed. Sleep Trial – Yogabed offers a 101 night comfort trial. Warranty – There is a 10 year warranty on this mattress. Shipping – Shipping is free and will arrive compressed in a box. Yogabeds only ships to the continental United States at this time. Free Pillows – Every Yogabed purchased comes with free pillows! Giving Program – For every 10 beds sold, Yogabed gives one to charity. Think the Yogabed is the mattress for you? 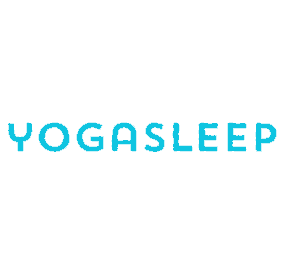 You can use the code SLEEPOPOLIS to save $100 on the purchase of your Marpac Yogabed! Is the Yogabed right for you? Now that we’ve taken a look at what makes up a Yogabed and put it through our Sleepopolis tests, it’s time to discuss who this would be a good fit for. Mattress that sleeps cooler – I found that the thin cover on the yogabed was pretty breathable and allowed for some good airflow through the mattress. The gel memory foam also does a good job of temperature regulation. Sleep in multiple positions – The Yogabed does a good job of allowing you to change positions. Also, it has a general feel with a medium firmness, so it is a good fit for a wide range of sleeping positions. 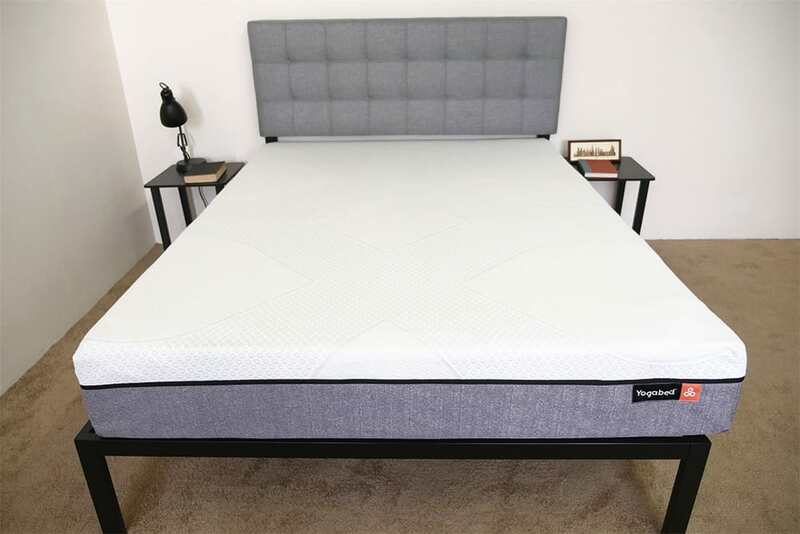 Memory foam without getting stuck – By placing the response foam layer over the top of the memory foam the Yogabed does a good job of providing the classic pressure relief of a memory foam mattress, without the feeling of being stuck. It’s so hard to decide which one is better. They all seem so great. Yoga bed is wonderfully built to be comfortable and keep you more on top. I like this as I am a stomach sleeper.